SHLOK took roots when Ashwin Natarajan, a Marketing manager who regularly drove by a government school in one of the busiest areas of Bangalore, was determined to do something meaningful for the little students he saw frolicking on the playgrounds. He posted a rough plan in the internal community website of his company and waited for likeminded folks to reply. And when Ashwin, Darshan, Tania and Swetha initially followed their calling to do something meaningful for the kids in a government school in their locality, SHLOK was barely an idea in their heads. But when they set foot into the classrooms, the disparity between private education and government schools in India hit them harder than they thought. The kids were trying to learn as much as they could midst the shortage of teachers, poor infrastructure (you will not see tables and chairs here – they make do by squatting on the floor), dire problems at their homes and poverty. We interact with tiny tots whose priorities are carefully preserving their cupcake (a rare serendipity for them from generous sponsors) with their mothers or embracing incentives like a small toffee for performing well in class. We interact with bright minds with sparks in their eyes like the kids from private schools, but only being denied quality education. And it is this very class full of kids that has, and continues to inspires SHLOK each day, and the 60 volunteers who have joined hands to help fill a crucial gap between education in urban/rural government schools. We make a sustainable impact in the lives of talented children who do not have access to urban education, through weekly classes by SHLOK members. We have developed a curriculum for English and Computer Science that comprises of the absolute necessary basic, and is being taught across all of our chapters. 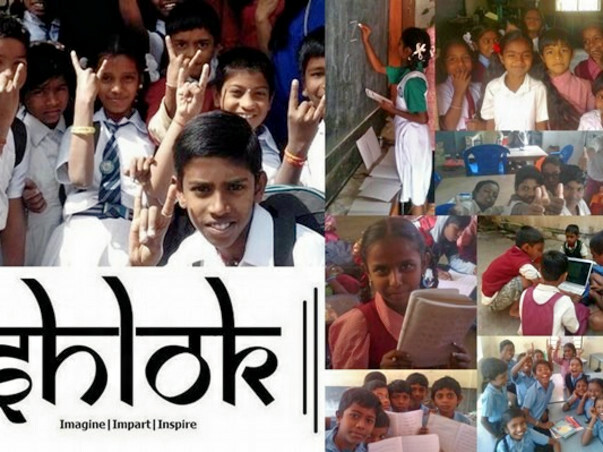 With a passion for education, SHLOK was built with an aim to reach out to as many schools as possible across the country. A lot of meticulous effort has been put into the SHLOK Volunteering Model to make it easier for people to support the cause. And this has resulted in successfully active chapters in Bangalore and Chennai. Our main focus areas are to improvise the approach and depth in English and Computer Science. Our core inspiration that we want to implement in our chapters is the Sugata Mitra model. We are currently in talks with Dr Sugata Mitra to see how we can implement his model in our schools. (https://www.ted.com/talks/sugata_mitra_build_a_school_in_the_cloud). Your contribution will enable learning through laptops in schools which otherwise do not have access to technology of any kind. You will be helping little kids to learn better and harness their true potential through an approach that is relevant today and is future ready. We are a registered charitable trust under the Government of India.